For a business owner, architect or developer creating a lasting impression is important when imagining the exterior of a business. The shape and size of a building and its paint color are important but even if you are working with an old building or cannot renovate you can still do a lot with exterior structures and architectural touches. Custom planters in Cambridge, Mass. Have you ever heard the saying “don’t sweat the small stuff?” Well in this case, ignore it. Small exterior details can be crucial at establishing your business because that’s the first impression any prospective customer or client will ever have. Small items like lanterns, posts, mailboxes, window boxes and planters can help create an inviting and classic look without a ton of effort. Planters with flowers or greens flanking an entryway or a beautiful lantern post right out front can give a great boost to your business’ curb appeal. A custom pergola installation makes a truly grand entrance. To make a bigger impact add a larger structure to the exterior of your business. A great investment is an attached or freestanding pergola. This kind of structure creates an exterior space to relax under or a covering to a walk or entryway that is sturdy, refined and long-lasting. Walpole pergolas are crafted in the finest cedar or wood alternative material AZEK™, a material that looks and feels like wood but will not rot, split or chip and requires no-maintenance. Another option is to add something smaller but impactful like a beautiful arbor to add interest to an entryway or a a trellis above doorways and windows. Post and Rail perimeter fence at Merrimack Premium Outlet, Merrimack, NH. Fencing has more power than establishing privacy – it can also be a big factor in increasing curb appeal. A smart, clean, classic fence establishes structure to the exterior of a building and defines the space. The clean lines with posts and pickets add to the positive perception you are trying to create for your prospective clients. Add a unique or eye catching gate or pillars and you can have an enviable entry. 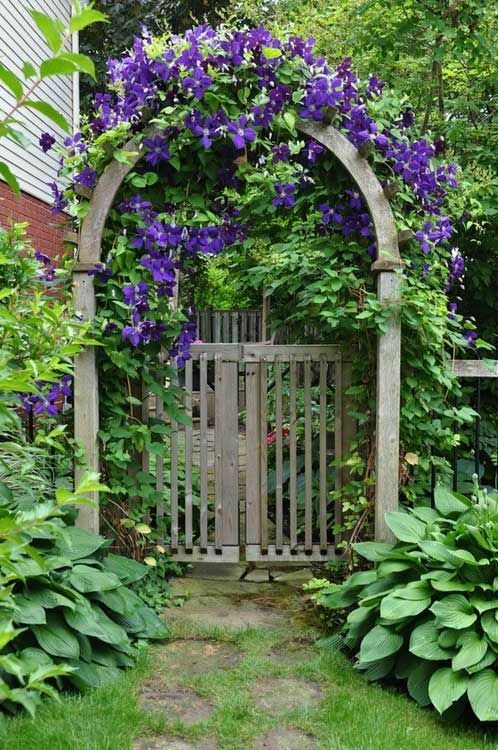 If you have a garden structure like an arbor, obelisk, lattice, or trellis you are always on the lookout for a beautiful climbing plant to really bring it to life. Luckily there is a climbing plant for every style; some with colorful flowers and some with sweeping vines. Which one is the best for your home? Which one grows the fastest and lasts the longest? Here are five of our favorite climbing plants that will bring your home and garden to life and last throughout the season. 1. Clematis. The clematis plant is a well known and common climbing plant for good reason. This beautiful plant grows quickly and latches on to just about anything. This won’t just look good on your garden structure but will also climb along you fence and up your mail and lantern posts as well. The flowering vine looks amazing in the spring and summer with beautiful pink and purple flowers blooming everywhere. 2. Wisteria. If you are looking for true drama consider planting some sprawling wisteria. This plant grows fast and produces long lavender blooms that add elegance to any structure. This plant is harder to grow than some others and requires a sturdy structure to support it and a good deal of care and pruning. Grow this on a trellis or arbor over a walkway but keep it away from other, smaller plants, as it is competitive for space. 3. Moonflower. A beautiful, classic climbing plant is the moonflower. The plant grows thick on just about any structure with beautiful white flowers opening all over. This plant looks great on any structure because it creates a thick, lush covering. Moonflower grows best around its supports so give it some guidance and send it on its way. 4. Star Jasmine. If you are looking for a beautiful evergreen vine go for star jasmine. This plant grows quickly on structures like arbors and fences with white flowers blooming through the spring and the summer. This plant looks great in the off season when it isn’t growing with its sprawling and lush greens remaining on your outdoor structure. 5. Climbing Roses. A true classic, climbing roses add a touch of elegance to any garden structure. Depending on your needs you can choose between climbing (smaller long lasting blooms) and rambling (larger blooms that only open once a season) roses, both of which are beautiful climbers. 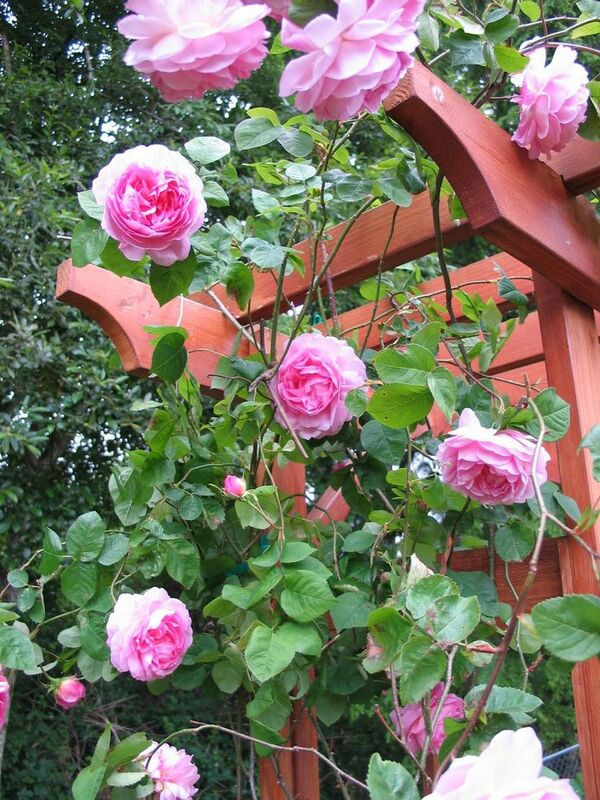 You can find climbing roses in a variety of colors to suit your needs. Add these to a trellis or an arbor and watch them open in the warm weather! Creating a beautiful outdoor space is important for homeowners and business owners alike. A striking outdoor space can make your home or business more inviting, boost curb appeal and boost a property’s value. Aside from adding larger scale structures like fencing and pergolas you can add immense value by just adding a splash of color. A great way to get that color in a lovely and manageable way is with a planter or lattice panel. Planters and lattice panels give flowers and other plants a contained space to grow and add character. These outdoor tools also make flowers easier to manage and move. The charming Rosewood Classic Lattice Panel. If you are short on horizontal space go vertical! Dress up an empty exterior wall with a simple lattice panel and let those climbing plants climb! All you have to do is install and start growing – many climbing plants will climb on their own and require only a little trimming as they grow. Lattice is also a great thing to consider when creating any kind of partition. If privacy isn’t a huge factor skip the fence and add a larger scale lattice panel or lattice fence. This structural change will allow you some creativity – instead of having a plain fence you can have large space for a variety of lush climbing plants. Privacy with charm is shown here by the smart combination of stepped crisscross lattice panels fronted by planters. If maneuverability is a big concern for you then a planter is a great choice in adding some color and life to your space. Available in a variety of shapes and sizes, planters are an easy all-weather way to add charm to an entryway, porch, or outdoor gathering space. Planters can look great pretty much anywhere – even indoors! Purchasing a versatile and durable planter is ideal so you won’t have to worry about unsightly chips and splitting. Walpole planters are made from AZEK wood alternative, a material that is virtually maintenance free and won’t warp or rot like wood. These planters can weather just about anything and can be used all year long to add some color. Sick of the winter yet? Luckily spring is right around the corner. Start your celebration of the season off with some lovely and inspiring container gardens and arrangements around the exterior of your home. All you need to spruce up your yard in the transitional period is a quality planter and a little creativity – and maybe a green thumb. Daffodils are a classic spring flower. A great idea when creating a container garden is to choose a theme or color and really go for it. Coming from the dreariness of winter a bold bright garden is perfect for elevating your home’s exterior and lifting spirits. Plant a number of beautiful yellow flowers, with seasonal greens, in your best planter (maybe your Rectangular Rockport Planter) and put it at your entryway or another location that gets a lot of visibility. Daffodils are perfect for this kind of arrangement because they thrive in early spring and are vibrant in color. You can also choose pansies and crocus, both early spring favorites that bloom in bold yellows. A lovely array of pink flowers grows in this Paneled Planter. What color comes to mind when you think of spring flowers? Chances are it’s pink. A great way to welcome the season is with an arrangement of varying shades of pink. This monochromatic look is chic and anything but boring. With the color as the theme you can go crazy with what kinds of flowers you choose trying out different shapes and textures. The only thing you need to consider is the needs of each kind of plant you choose – making sure they are all similar will enable you to keep the arrangement healthy and bold all season long. A great planter garden uses texture and shape to create a lush space. Another idea for getting that perfect container garden is to really go in on the varieties of plants you are using. One way to achieve a truly lush arrangement is to go with plants that have varying, but complimentary, shapes and textures. Dianthus is a great choice for this kind of arrangement because it looks great planted in close clumps. Another wise choice are snapdragons for their bold colors and unique shape and the always versatile ivy for some delicate hanging pieces. This kind of arrangement would look lovely in a more shapely planter like the Tapered Planter or in a window box. Shop the full line of planters and window boxes on the Walpole Outdoors website and share your spring gardens with us on Facebook or Instagram! Crafting an outdoor space is as much style as it is function. Stylish planters can serve as beautiful accents to other structures or become structures of their own – becoming barriers when placed together on a perimeter or as support when used to construct a self-anchoring pergola. Rockport Planters utilized as a barrier. Fencing and railings are beautiful ways to create a perimeter but sometimes a space just calls for a little more. Here you can see our stylish Rectangular Rockport Planters used as an outer border to a series of tennis courts. This space already has fencing where height is needed but the area alongside the court needed a little something different. The planters are durable and useful in every season as well as a great way to add some life and color to an otherwise open space. Planters act as support for this anchored-pergola. wonderfully as living privacy screens or as bases for anchored-pergolas on rooftops. These planters serve as the base for the lattice beam that supports this roof-top pergola – a clever and safe way to construct a structure in an un-traditional location. Need something that will fit in to existing decor style? Walpole will handcraft custom planters in any style and to the dimensions that meet your specific needs. These are crafted in AZEK™, a low maintenance material that looks just like natural wood, yet won’t rot, crack, or split, and will hold its pristine appearance for years. AZEK planters do not require liners. We will also pre-paint your planters in your choice of more than 100 Sherwin-Williams VinylSafe paint colors, which come with a 25-year warranty. Planters are also great for their traditional use – beautiful accents to outdoor and indoor areas. Planter gardens add a little splash of life to wherever they are placed and can be moved and changed depending on the season. All planter boxes have pre-drilled drainage holes. For interior use or easy seasonal changes we offer copper and plastic liners for our Small Square Planter, Small Rectangular Planter, and Large Rectangular Planter. These public school pergolas are great for students and teachers alike. Parents, teachers, and administrators alike are delighted that arriving pupils can stay comfortable even on rainy mornings under the solid roof covering of an impressive expanse of pergola. Substantial supporting columns atop stone bases add to the pleasing architectural design. On the other side of the building high-schoolers can chill in an outdoor area not far from classrooms and the demands of a rigorous curriculum. This inviting seating area is defined by an extra-long custom pergola. A smart feature is the pergola’s solid roof, providing shelter no matter the weather. For generations, Walpole has worked with builders, developers, and architects to create custom outdoor structures to exacting specifications and style demands. Today, our custom pergolas are handcrafted in low maintenance, long-wearing cellular PVC. The expansive pergola on the front portion of the building. Pergola covering a seating area. This pergola provides shade for students when they are enjoying the outdoor seating area.